Before I started this experience I honestly didn’t care much about ants. I didn’t really even know that there were many types outside of red ones (avoid these) and black ones. 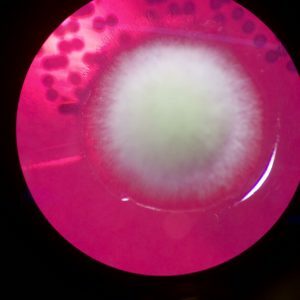 However, after meeting my scientists and learning more about the great diversity of ant species, they’re growing on me just like the fungal pathogens growing on my petri dish in the lab. Yesterday, all of the Students Discover Fellows went out to dinner to get to know each other better. It was a great time, but the most exciting part of the evening was the walk back to our cars when Magda (my scientist) discovered a bunch of ants that were carrying other ant larva on the sidewalk. She told us that these ants were a genus called Polygerus, which are unable to feed themselves because of the way their mandibles are structured. Because of this, they steal larva of other ants (usually the formic acid spraying Formica) and make these baby ants their slaves. All of this was happening on the streets of downtown Raleigh. 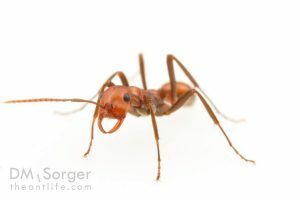 Previously, when I thought about crazy ant stories, I pictured them set in the depths of the Amazon Rainforest or somewhere in remote areas of Africa. But crazy ant stories are happening literally right outside my house, just like crazy science is happening right outside the homes of my students. We just have to look for it! 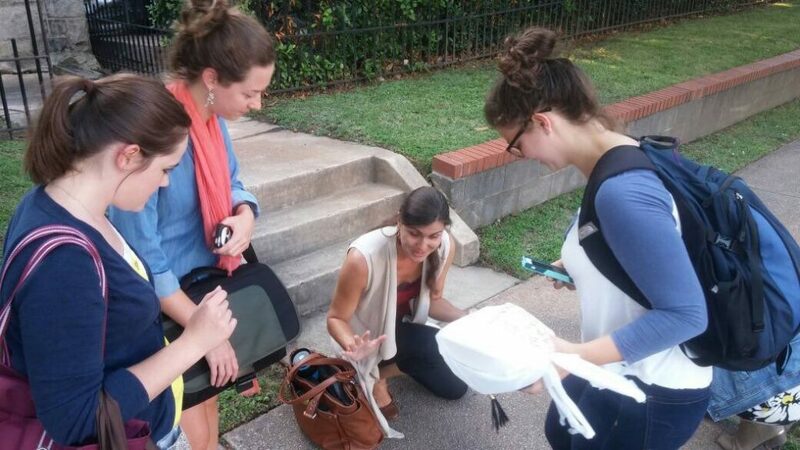 A super excited Magda teaches us about slave making ants in the middle of downtown. 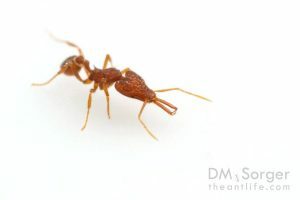 Magda’s macro photo of the polygerus ant. Its jaws are smooth so it can’t chew any food! 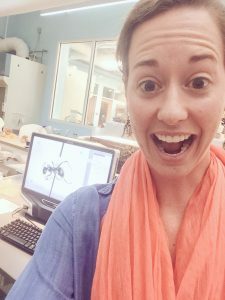 As of today, I’m already a third of the way done with my time in the Ant Lab. It’s hard to believe that it’s only been five days because I’ve already done so many things that I’ve never done before – from collecting fungi off of fire ants to becoming one of the only people ever who has witnessed the Strumigenys Ant (a cute little girl with trap jaws) jump backwards. It’s been challenging, but awesome, and I’m getting a glimpse of how my students feel when I knock a lesson out of the park. Magda’s picture of Strumigenys. This super tiny ant can jump backwards when threatened using its jaws! While remembering how to open my eyes to new wonders isn’t explicitly stated in the goals of my externship, I think it’s one of the most valuable parts of my experience. In the midst of playing student, I’m contributing to the first lesson plans using the new data visualization program CODAP, which is is a kid friendly way for students to manipulate real data related to ant behavior around the world. While working on my research-aligned lesson plans is important, it’s also been awesome to have the chance to teach my scientists some things about what it’s like to be a teacher. When I started this fellowship, I assumed that I would be very much the student in my relationship with the scientists, but I have been impressed with the desire that these brilliant women have to understand the education system and the reason behind the decisions I make in my classroom. Super excited after I successfully made a video of myself mounting a formica ant under the microscope. I’ve already learned so many new things through this process, and there’s still two weeks to go! I hope that like me, my students who may not initially care about a given topic in science will gain a new appreciation through my teaching, even if they don’t remember every part of a cell or every cloud type by name. Similarly, while I may never be able to tell you whether that ant on the sidewalk is polygerus, formica, tapinoma, strumigenys, or a plain old fire ant, I will be able to appreciate these insects as diverse, complex, and beautiful because I opened my mind to learning about them, and that might be just as important.